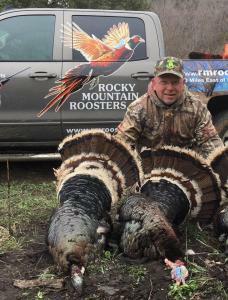 RMR has several states to try your luck hunting gobblers. If you are looking for great Rio Grande Turkey hunting, you need to look to Texas. We take several groups a year to Texas for Turkey and Hog hunts. These hunts start the end of March and run through April. There is a two bir d limit here. Kansas and Nebraska are the states where we chase the Eastern Turkeys and the population of long beards is large and you can shoot two-three birds in these areas as well. The best time to hunt Kansas is from the first of April to the middle of May. 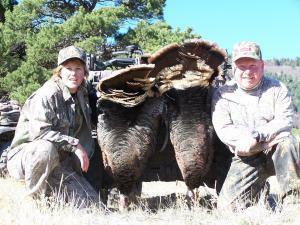 New Mexico is our choice for hunting Merriam Turkeys and it is also a two bird state. We hunt the last part of April in New Mexico and into the first week of May. Very limited openings in NM. We also have a few spots in Colorado that we offer on a limited basis. Mid April through the end of May in Colorado. If you want your grand slam, call us. We have taken Osceola birds in Florida and Goulds in Old Mexico and can set you up with the right guides to finish off your slam.